Neumann, who was electronics chief for VW cars until 2004, returns to the carmaker Dec. 1. VW announced Wednesday that it had picked former Continental AG CEO Karl-Thomas Neumann, 48, for the newly created role of group chief officer for electric traction. Neumann, who starts his new job December 1, will report to Winterkorn. Neumann left Continental in August following a power struggle with controlling shareholder Schaeffler Group. He was replaced by the former head of Schaeffler's automotive unit, Elmar Degenhart . 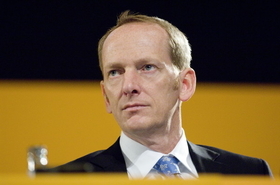 Neumann joined Continental from VW in 2004 and was named CEO of the Hanover-based supplier in August 2008. Before he took the top job, Neumann was the supplier's chief technology officer where he played a key role in the opening of Continental's lithium-ion battery plant in Nuremberg, Germany. From 1999 to 2004, Neumann worked for VW where he headed electronics research and electronics strategy, later assuming responsibility for electronics at the VW passenger car brand. Neumann has a doctorate in electrical engineering, which he studied at the universities of Dortmund and Duisburg.